Myss Lafunky's Blog: Common Sense vs Uncommon Sense? Wow! What a great testament as to the truth of God’s words. Thanks for making it so plain. You are welcome. Thank you Brittany for taking your time to read and comment. Wonderful list! God's word is always wise! 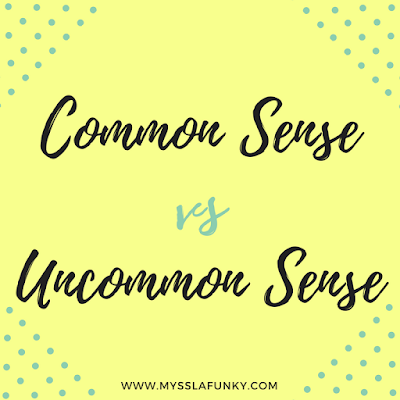 Our common sense is not. His ways are perfect! Indeed God's ways are perfect! This reminds me of a scripture in the bible that says that God's ways are not our ways. Thank you Ruth for your wonderful comment. God's ways are far greater and better than man's way but any man who align his taught to God's word is wise. I really like your reference to God's ways are BETTER than our way. Indeed! In the midst of trials may God help every believer to know that He has better plans for us all.